Dr. Michael Messieh is a Canadian and American Board Certified Orthopedic surgeon. He has over 15 years of experience in hip, knee, and shoulder replacement surgery. 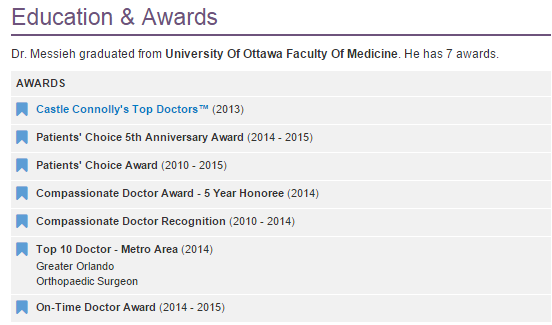 He attended medical school in Ottawa, Ontario, Canada and completed his internship and residency in Ottawa and Toronto, Canada. He completed orthopedic total joint training at the New England Baptist Hospital, Boston, Massachusetts in 1992. He then spent 10 years in St. Paul, Minnesota performing total joint replacement procedures. He has published numerous articles in professional journals and maintains ongoing research projects. 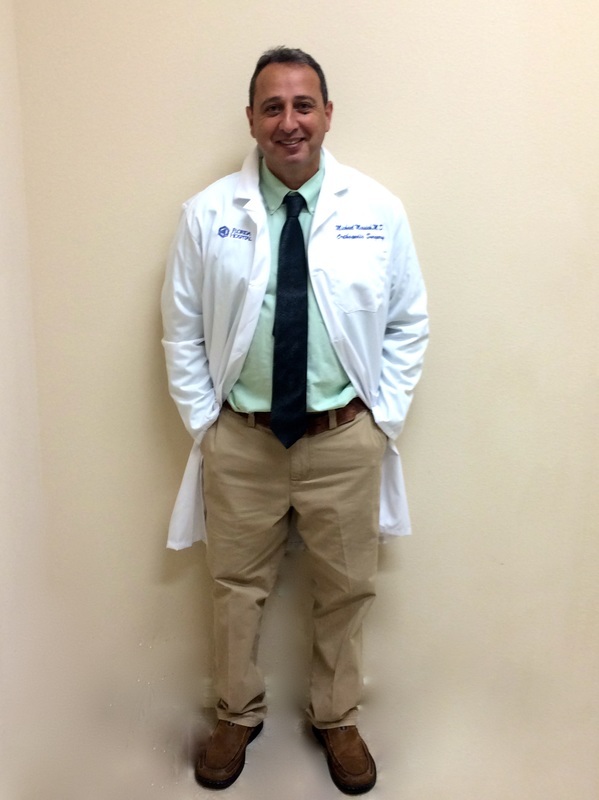 Dr. Messieh's practice is focused primarily on joint replacement surgery of the hip, knee and shoulder. He has been chosen as a Castle Connelly Top Doctor. Patients are personally evaluated at offices in Celebration, Clermont and The Villages, Florida. He performs surgery at South Lake Hospital, Heart of Florida and Celebration and the Davenport ASC surgery center. He has state of the art pain management protocols and developed a rapid recovery rehab program which translates to improved surgical outcomes, less complications and greater patient satisfaction. Preoperative Hemoglobin and Warfarin response. Journal of Bone and Joint Surgery (British Volume). On-Time Doctor Award (2014, 2015, 2018)Vitals On-Time + Promptness Award recognizes doctors with consistent high ratings for timeliness of appointments. The honor is granted based on a physician's overall and promptness scores. Patients' Choice Award (2010, 2011, 2012, 2013, 2014, 2015, 2016, 2017, 2018)Patients' Choice recognition reflects the difference a particular physician has made in the lives of his/her patients. The honor is bestowed to physicians who have received near perfect scores, as voted by patients. Patients' Choice 5th Anniversary Award (2014, 2015, 2016, 2017, 2018)The Patients' Choice Award - 5 Year Honoree is a recognition granted only to those doctors whose ratings have reflected excellence in care for five years in a row. Only 1% of all doctors in the United States are bestowed this honor by their patients. Compassionate Doctor Recognition (2010, 2011, 2012, 2013, 2014, 2015, 2016, 2017, 2018)Compassionate Doctor certification is granted to physicians who treat their patients with the utmost kindness. The honor is granted based on a physician's overall and bedside manner scores. Compassionate Doctor Award - 5 Year Honoree (2014, 2015, 2016, 2017, 2018)Vitals Compassionate Doctor Award - 5 Year Honoree recognizes doctors with the highest scores in bedside manner for five consecutive years. This honor is granted to a few distinct doctors in the United States based on experiences shared by patients. Top 10 Doctor - Metro Area (2014)Top 10 Doctors are chosen by the millions of patients who visit Vitals each year to find a new doctor and share their experiences by providing ratings and reviews. In order to differentiate highly-regarded doctors from the rest for patients in search of quality care, Vitals awards Top 10 Doctor honors to those physicians within a certain specialty and geographic area who are consistently given top ratings by their patients. Castle Connolly Regional Top DoctorsCastle Connolly is America's trusted source for the identification of Top Doctors. Their physician-led research team reviews and screens the credentials of tens of thousands of physicians who are nominated by their peers annually, via a nationwide online process, before selecting those physicians who are regionally or nationally among the very best in their medical specialties. Castle Connolly believes strongly that Top Doctors Make a Difference™.